Alberta Spring & Trailer provides full service spring and suspension repair. We’re the spring experts and stock most springs, so we’re not waiting on parts. Our experienced mechanics can diagnose and repair all spring and suspension problems. We can service all the components of your suspension system including control arms, ball joints, springs, shock absorbers, struts, and more. 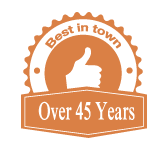 We service all major makes and models, and strive to get you back on the road faster.